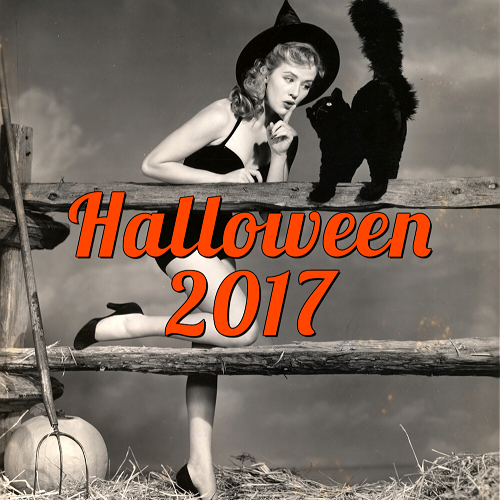 Want a chance to live in your favorite horror movies like The Shining, Nightmare on Elm Street, Beetlejuice, IT, and The Lost Boys? 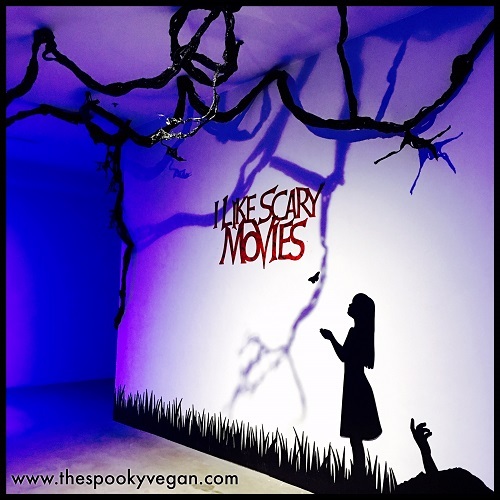 If you're in LA, you are in luck, as the new art installation called I Like Scary Movies, opens tomorrow, Thursday, April 4th! 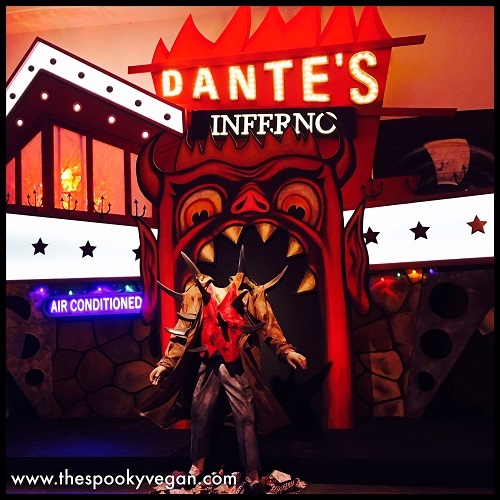 This time, the horror fans get their very own selfie museum, complete with recreations of some of your favorite scenes, characters, and set pieces from iconic horror films. Take a tunnel down to the sewers to float with Pennywise from IT: Chapter One, get trapped in the Overlook Hotel from The Shining, go down to the boiler room from Nightmare on Elm Street to sit on Freddy's throne and flee with his larger than life glove, head to the Murder Capital of the World to hang in the lair of The Lost Boys, and brush up on your Handbook for the Recently Deceased in the afterlife waiting room of Beetlejuice! 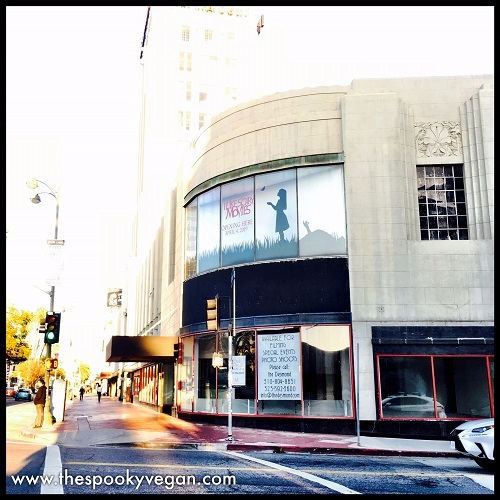 I Like Scary Movies is located in the historic Desmond building in Los Angeles. 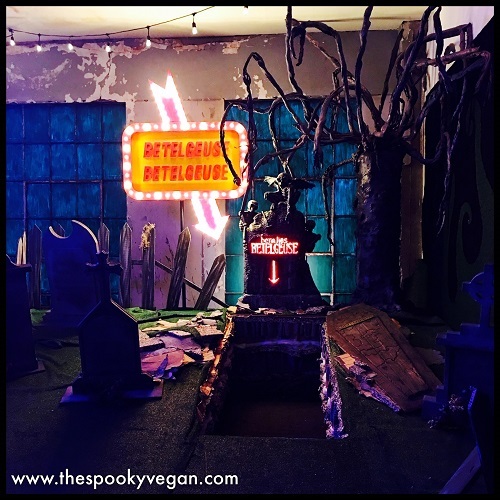 When I arrived I took their neat old elevator up to the second floor, all 25,000 square feet of it converted into a horror-lovers dream! With the blessing from Warner Bros., artist Maximillian has created what he calls "three-dimensional fan art" and I couldn't describe it better myself! 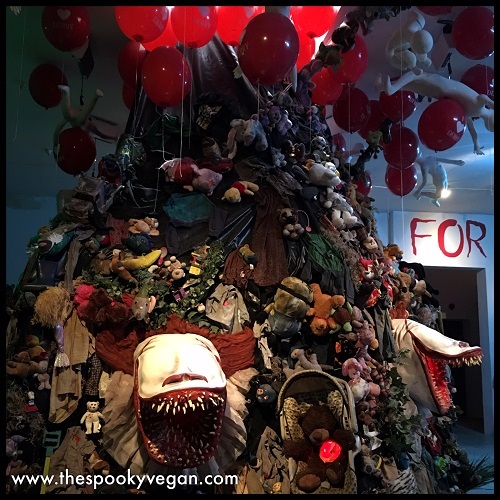 I have been watching the fabrication of the exhibit come together on the I Like Scary Movies Instagram for months, and I've been fan-girling over all the incredible installations they have been putting together. To see them all completed made me grin ear-to-ear! 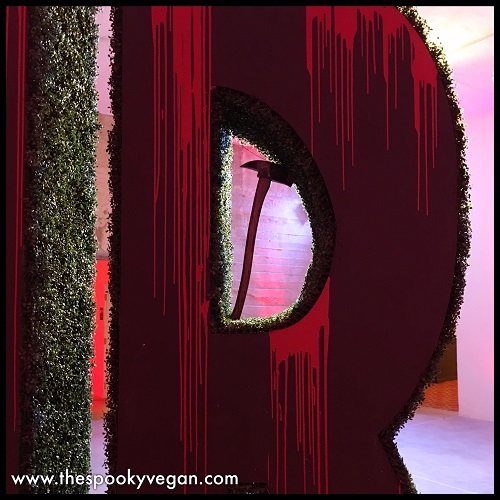 You enter through the "REDRUM" room, with huge hedge maze-like letters spelling out the infamous phrase. 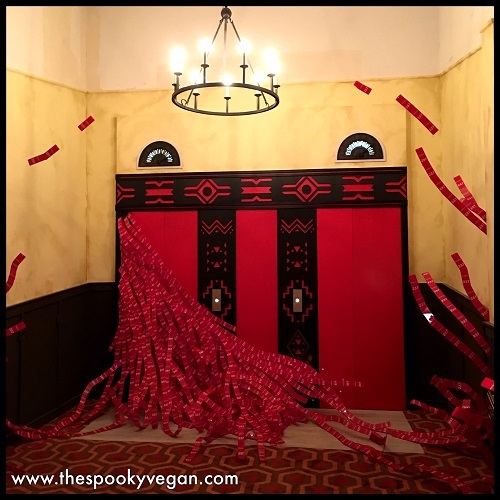 At an alcove to your left you can see the Overlook Hotel's elevators spilling forth with red room 237 door tags representing a cascade of blood. 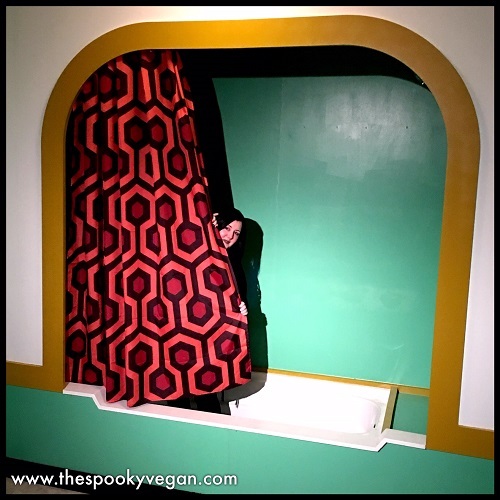 Another alcove takes you into room 237's bathroom, where you can climb into the tub to reenact the old woman scene from the film. 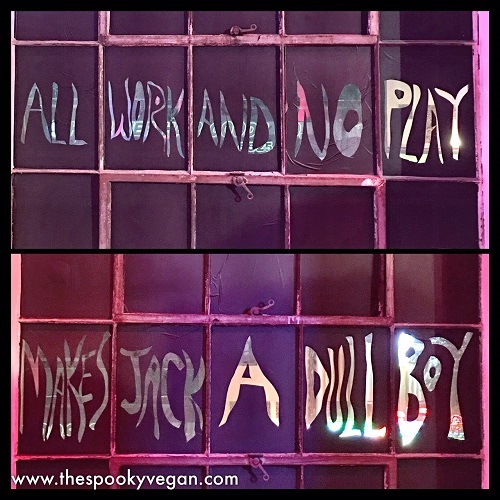 From there, you walk into another room dedicated to The Shining, bordered with a hedge maze and featuring two photo opportunities - one of the bathroom door Jack breaks down with an ax and the other an exterior shot of the bathroom window that Wendy escapes from. 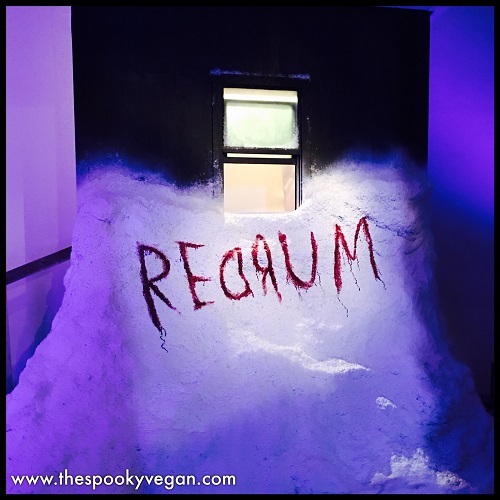 The third and final Shining-inspired room awaits, and this one is probably the most impressive. 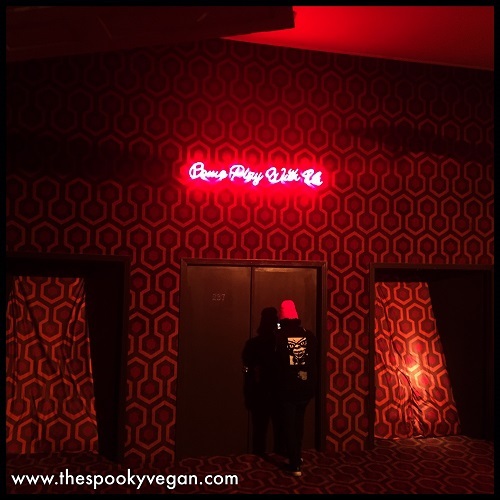 It features wall-to-floor Overlook Hotel carpeting that makes you feel as if the hotel is eating you alive! 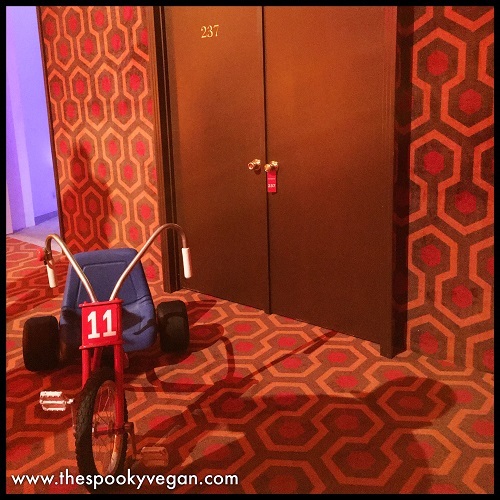 There are several photo ops in this room, from the twins to Danny's tricycle to Room 237 to even a place where you can "sink" into the carpeting! 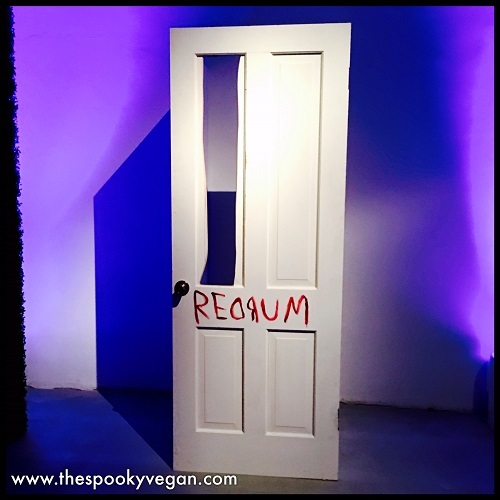 Don't forget to peep through the gouged out door of Room 237 to get a fright! 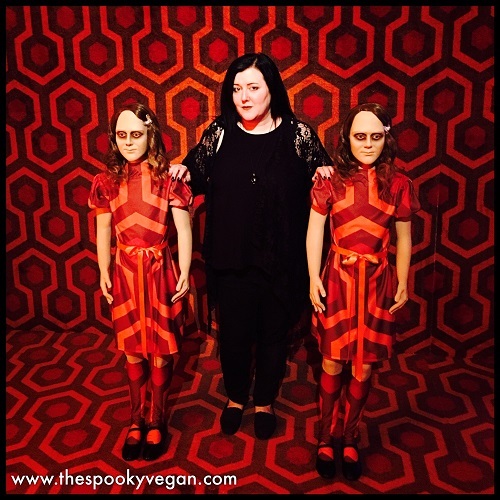 Loved this photo op from the clown room in the Neibolt House! Leave your fears, take a penny! Once you escape the Overlook, it's down into the sewers to follow in the footsteps of the Losers Club from IT: Chapter One. Can you smell the popcorn yet? 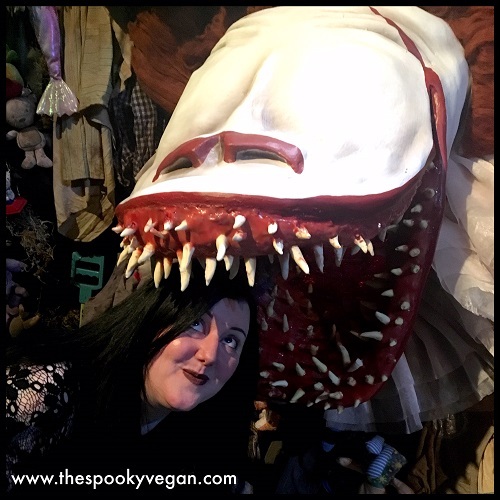 Once you get through the spinning funhouse tunnel, you emerge in the sewers of Derry, where you are faced with a tower of toys and debris and the hungry mouths of Pennywise opening wide to show off his shark-like rows of sharp teeth. 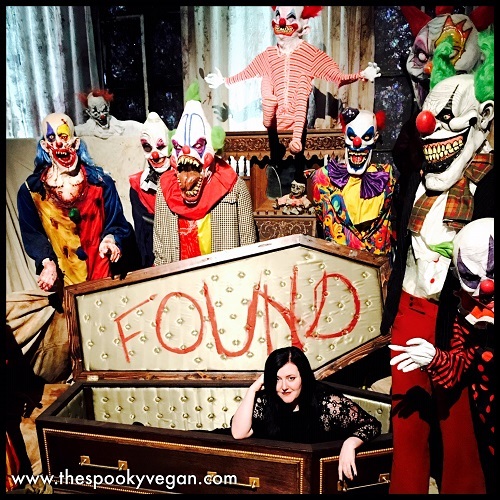 Follow a path through tiny paper boats and you'll encounter the clown room from the Neibolt House, complete with a coffin you can get cozy in for pics! 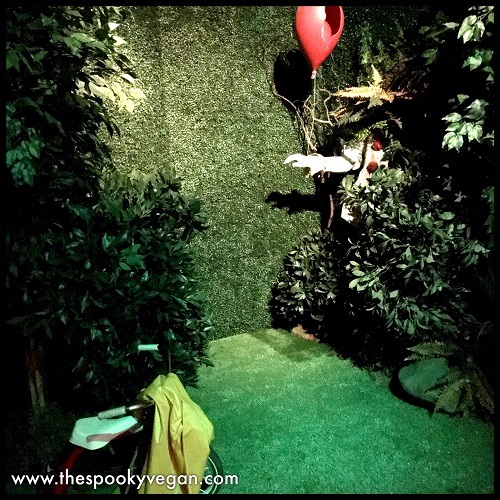 Across from that, take Pennywise's hand for another photo op. 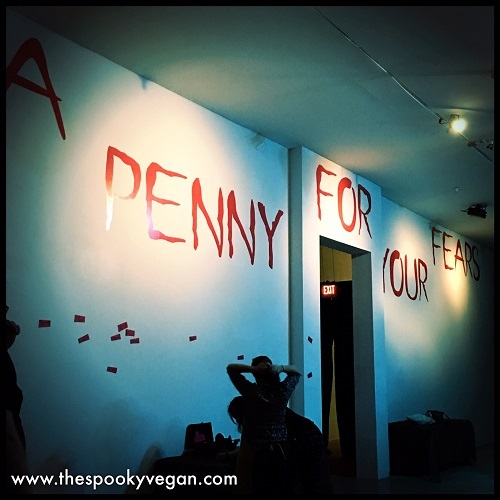 Before leaving the room, write your fears down and get a penny for your fears! The next hallway has two Nightmare on Elm Street rooms. 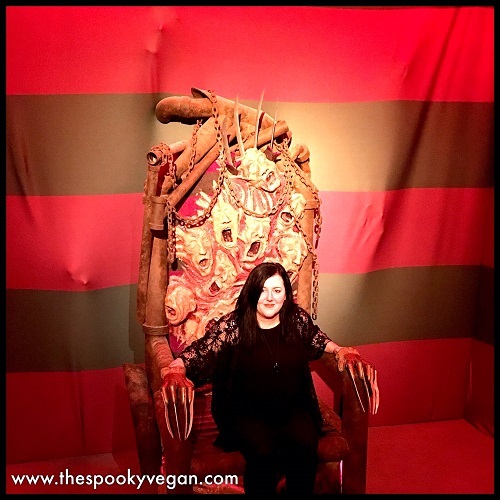 One features Freddy's throne where you can sit as faces push through the red and green striped walls! I love how this looked! The next room features the huge articulated glove of Freddy - yes, the blades move up and down so you can pose them just right. The room is decorated like a boiler room (and I dare say, even smells like one?). Freddy's glove is really impressive and so huge in person! Barbara and Adam, plus a ball pit you can play in behind them! 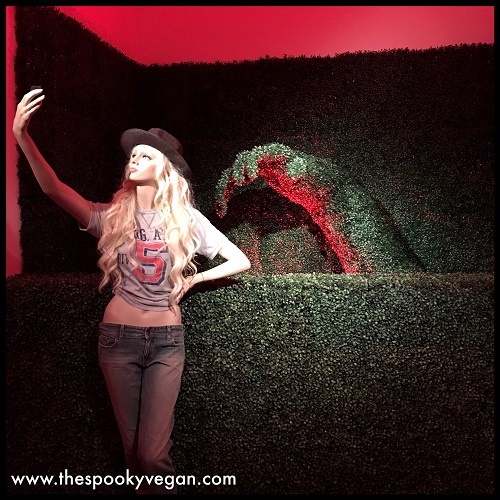 Next, you wander down a long hallway where in the middle is a really neat "I Like Scary Movies" room complete with black twisting vines and blue lights make a perfect backdrop for selfies. 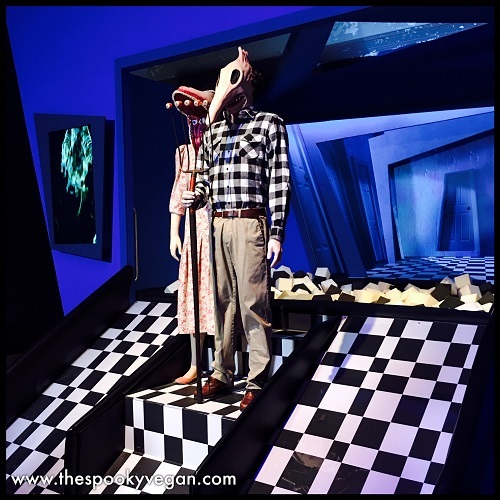 Continuing down the hallway, you'll get a peek into the Netherworld as you step into the waiting room of the recently deceased from Beetlejuice. Take a seat on one of the couches where you can get nommed on by a shark or lose your lower half. Kick off your shoes and jump in the ball pit behind Barbara and Adam and then slid down on either side of them. 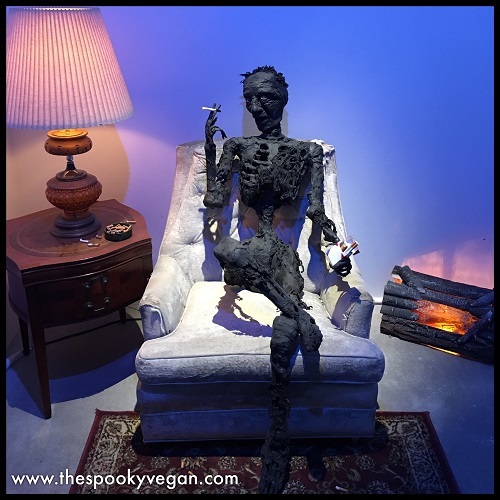 As you leave the room, take a look in an alcove to your left where you'll find the smoking man from the film. 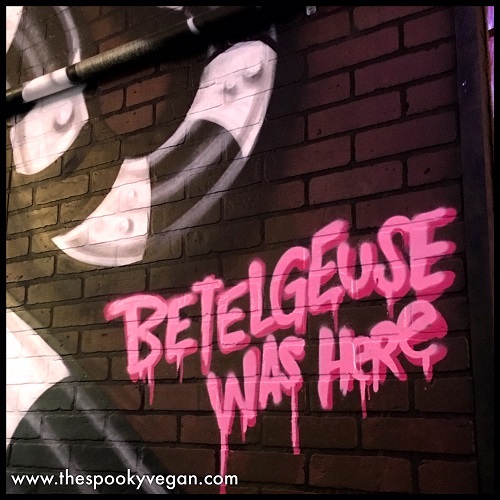 Continuing on, you can visit Beetlejuice's graveyard (and be the ghost with the most when you crawl into his grave for a photo op!) as well as a visit to Dante's Inferno. 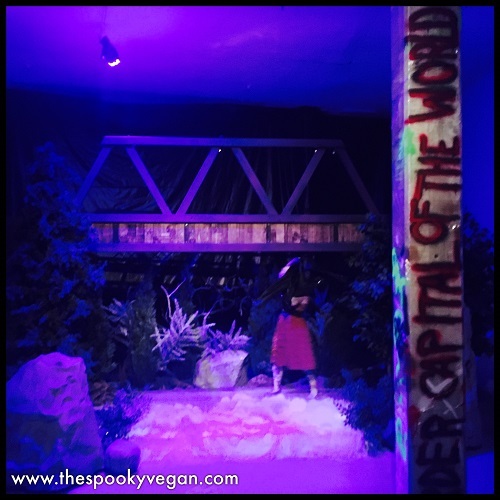 The exhibit continues in the next room with The Lost Boys lair, where you can hang from a replica of the bridge, visit the Murder Capital of the World, and hang out in the underground vampire pad. 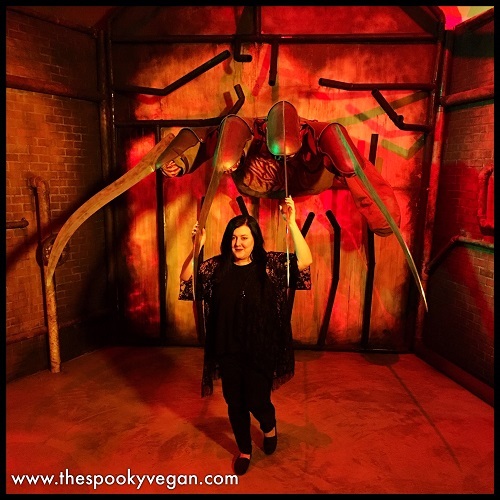 The last room features a huge scale Chinese take-out box where you can nestle within strands of huge worms for an unforgettable photo! 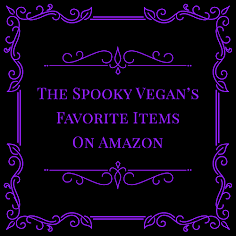 This room also holds some merchandise, including I Like Scary Movies t-shirts, Funko Pops from horror characters in the exhibit and other items. 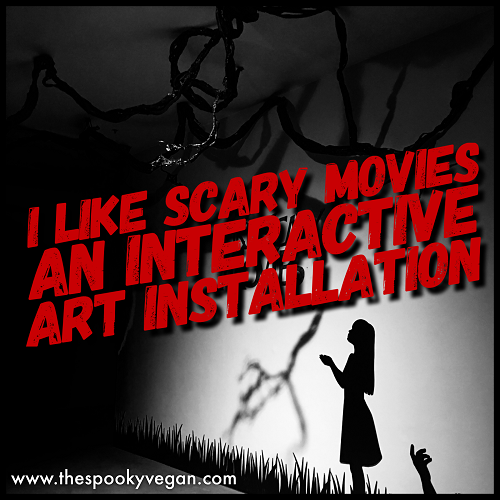 Overall, I Like Scary Movies is a really fun interactive experience for horror fans. 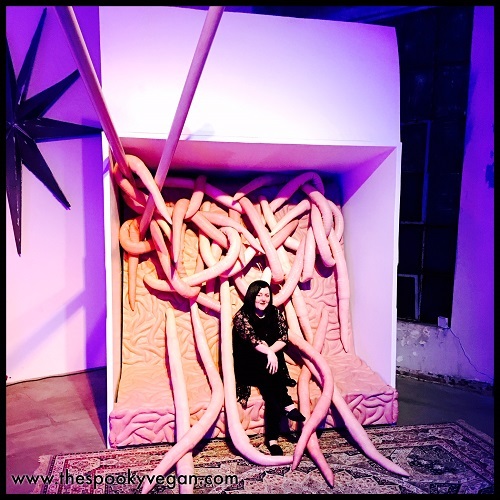 The horror installations were detailed and paid homage to many favorite films of horror fans. I appreciate all the hard work that went into creating the different exhibits and everything looked stunning. There were a few blank spaces and walls I think they could have done a bit more with, but with the scale already so grand they may have just run out of time. 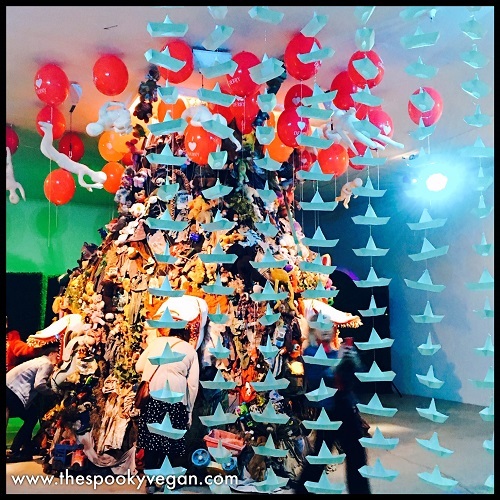 When I attended the preview, I think there were maybe 50 people in attendance, but we were able to take plenty of photos even with that high number of people. Since tickets are on sale for specific times, I think the crowd flow will work well in this exhibit, especially since you can wander through the rooms at your leisure and also double-back to re-do certain rooms or ones you may have missed on your first walk through. 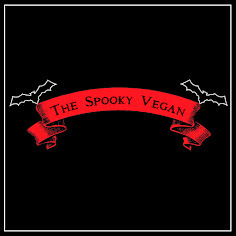 Also to note that there are no scare actors and this isn't a haunt - you simply walk through different themed rooms. 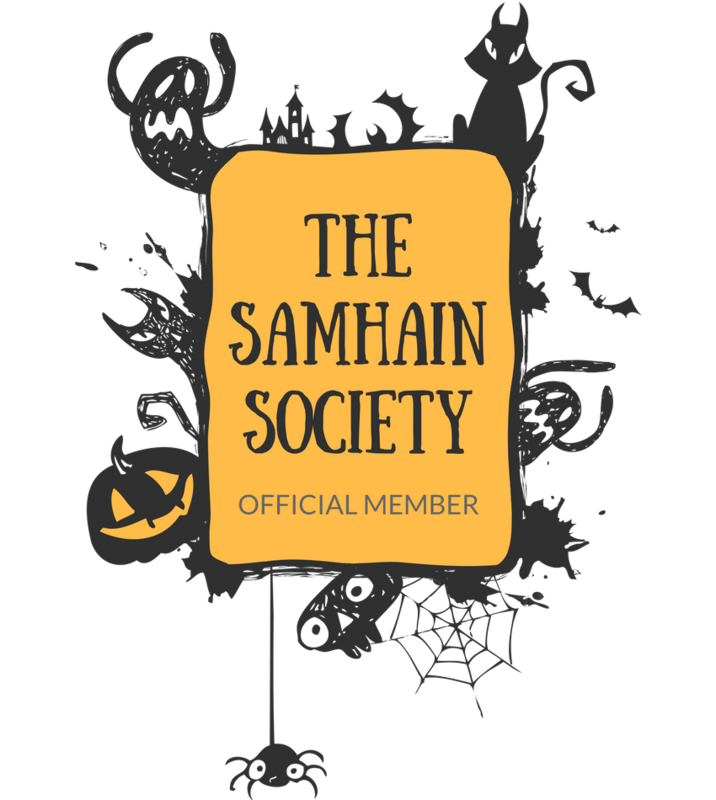 So even if you have a scaredy-cat in your group, they should be okay! 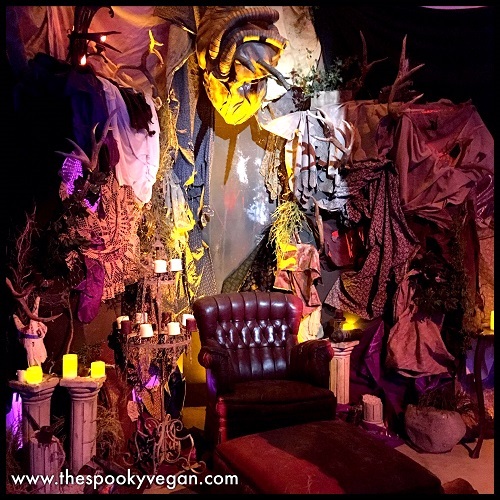 And groups are best for this exhibit since there are so many photo opportunities - get your whole ghoul gang to go and get some epic group pics! Plus it is handy to have someone with you willing to take photos of you (and you can return the favor by taking photos of them), though the staff is really helpful and will take any photos for you. 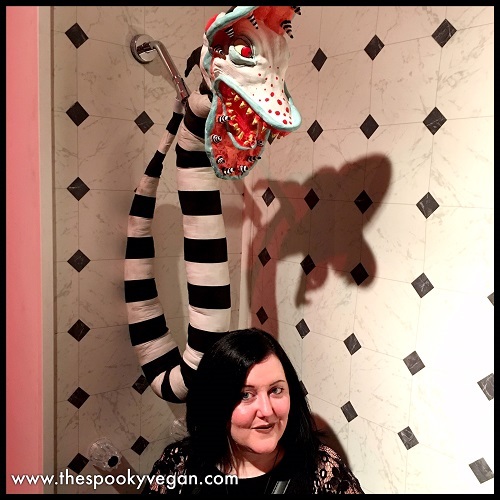 I enjoyed the experience, and even though I am an introvert and hate being the center of attention (eeeeeeek I hate having photos taken in public) I am glad I forced myself to take some selfies and had my photo taken throughout the exhibit. This event opens Thursday, April 4th and runs Thursdays through Sundays until mid-June. 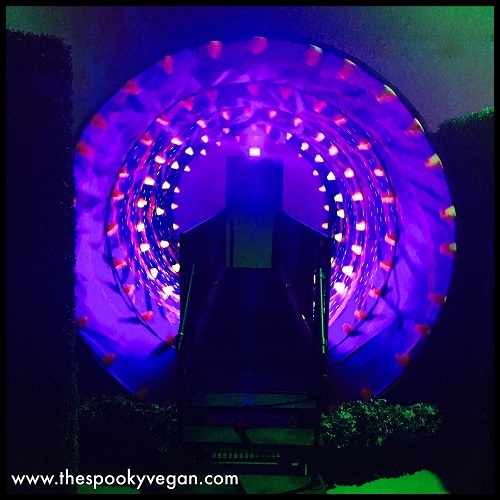 Tickets are $39 each and you should allow at least 45 minutes to an hour to walk through the event and take photos. 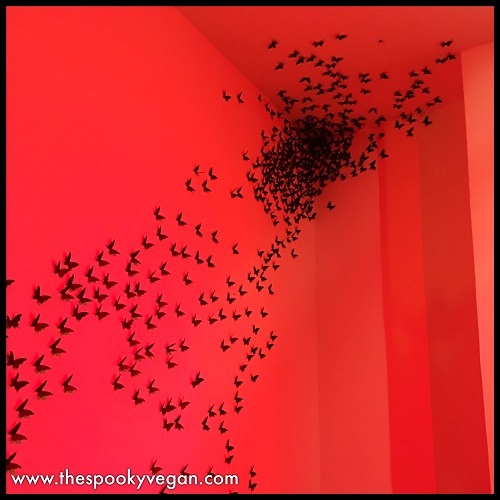 I would allow maybe an hour and a half so you can walk through the rooms a few times. 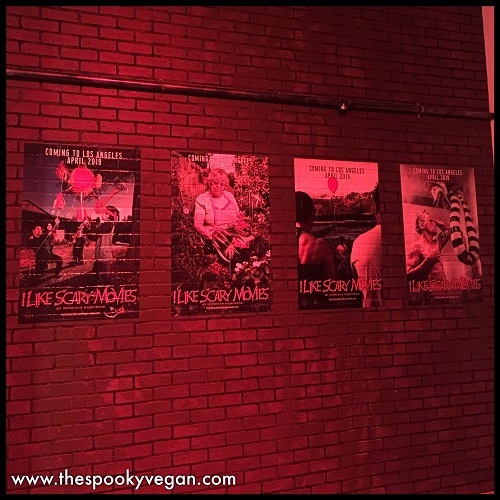 You can find more info and purchase tickets on ilikescarymoviesexperience.com! 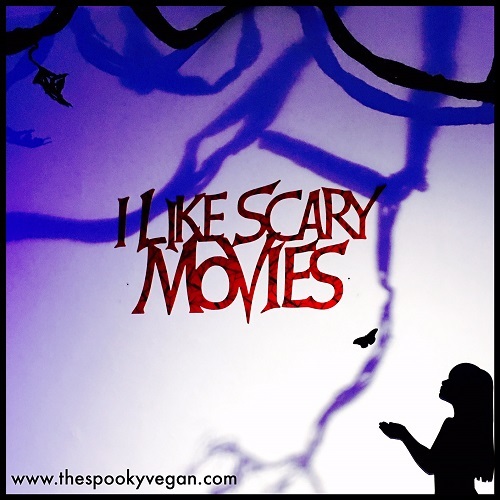 Will you be planning on attending the I Like Scary Movies Experience?